Trevone Boykin and #2 TCU struggled in their opener at Minnesota, pulling out a 23-17 victory. The Gophers haven’t beaten a Top 10 team since 1977. Boykin was his usual self throwing for 246 yards completing 26 of his 42 passes and a touchdown. He also ran for 92 yards and a rushing touchdown. 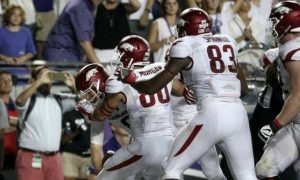 The Horned Frogs had plenty of offense in the game, but they had a tough time getting the ball in the end zone. TCU only had two touchdowns and relied on their kicker Jaden Oberkrom for the rest of their points. Oberkrom launched a 53-yarder, 45-yarder and a 33-yarder. Minnesota quarterback Mitch Lender threw for 197 yards and a touchdown for the Gophers. KJ Maye finished with four catches for 73 yards and a touchdown, while running back Rodney Wmith rushed for 88 yards and a touchdown. TCU didn’t look like their usual selves on Thursday night, but they were playing one of the more underrated teams in the country. Minnesota looks like an eight win team yet again and the Big 10 should be careful because the Gophers are definitely a threat this season. 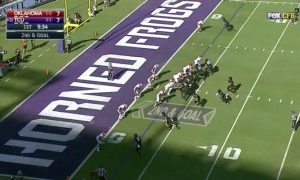 The Horned Frogs will host Stephen F. Austin next week and the Gophers will travel to Colorado.